This map supported by Patreon! I decided that, as a little Christmas celebration for myself, I would try out Kuusinen's tutorial over at deviantart.com to create a map different from some of the styles I usually go for. I hope you all enjoy. This map's background isn't as fleshed out since I mostly was just trying to see about making a map this way, but the best way to summarize is that our world's traditional powers got screwed over hard in this world. Most prominently, Russia, Denmark, and Prussia suffered heavy defeats by Sweden and her allies following the Thirty Years War, who expanded her empire to dominate trade on the Baltic Sea, expanding to its present large size after a series of wars that finally ended when Sweden beat Russia and Denmark enough to cause the powers to look elsewhere for expansion. Sweden, meanwhile, quickly set about consolidating their territory, expanding Swedish culture and ideas to the new territories. It was helped by the fact that a much better leader than Augustus the Strong came to power in Poland and Saxony, leading to the two nations dominating eastern Europe for years. While Poland and Lithuania eventually split up (though remain relatively friendly) in a revolutionary war for the Lithuanian Republic, Saxony dominated Germany in the absence of Prussia. After expanding and marrying across the Holy Roman Empire, Greater Saxony fought the Habsburgs for dominance of Germany. The result was, the German Empire was founded under Saxony with Dresden as the capital while the Habsburgs were reduced to the Archduchy of Austria. The newly-orphaned Hungary, interestingly, rose to prominence after years of strife, founding the Hungarian Empire and expanding into the Balkans where they compete with Russia and the Turkish Sultanate for dominance. Hungary also remains a major king-maker neutral, with enough industrial, economic, and population strength to possibly win a war by siding with one alliance over the other. In western Europe, the nations, on paper, are not much changed from our world, but outside Europe things have gone differently. British colonies in the New World formed a dominion-like state that has helped the British win major victories in the Americas, but the French have given the Brits a run for their money in both India and China, the latter of which fractured into Civil War in 1893. Sweden, the Queen of the Baltic, is renowned for its high-class culture, peculiar festivities, and a strange affinity for the cold. Winter celebrations in Stockholm, a prominent European metropolis by 1900, are a major tourist attraction, while Swedish scientists and engineers have led the way in technology as of late, creating faster and faster airships, advanced trains, and the new favorite technology: the radio. Sweden enjoys a living standard that is one of the highest in Europe, particularly due to its close relationship to Germany, Poland, and Lithuania, who are their major trading partners. Europe, for now, is peaceful. 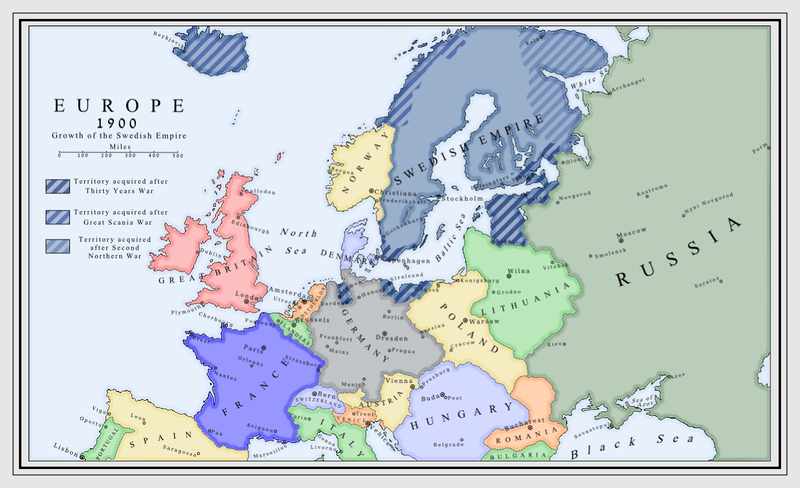 Russia, France, and Britain are busy in Europe while the minor-yet-growing powers of Italy and Hungary have not yet chosen sides. For now, all is well in the deep winter of 1900, and one can only hope it will stay that way in the near future.